Tags You can choose, by using a tag, to use the unstable branch. What is the difference in this docker compare to the others? self updating as other linuxserver containers are, and a newly compiled par2 that's more recent than 5 years old. I was hoping you guys would release this! Is this version of par2 multicore, by chance? Also, I know this is a longshot, but I don't suppose there is any way (via the environmental variables or extra parameters, perhaps) to be able to pull an alpha build of sab, by chance? (I would have edited my above post to add this question, but I guess this sub doesn't let me edit my posts). from what i can gather from a quick reading of the readme on their github repository, 0.8.x releases (alpha at this time) are not compatible with 0.7.x queues. just from that alone, let alone rebasing the container to use git rather than the sab ppa, means it doesn't look a viable option at this time. He is not saying it can't be done, but we don't see any value in it, at this time. (Unless we get lots more requests). So with the advent of multicore par support, does that being SABnzbd up to NZBget standards with regard to pars? Since 0.8 has now gone into beta, is it possible to get a beta 0.8 docker so we can make a copy of config folder and play with? Just a heads up, in a new installation of this container with the new beta, the incomplete and complete download folders default to respective folders in the config folder, not what is selected in the container settings. Anyway...Seeing this is a BETA and they are currently on Beta 3, and this is Beta 1, how do you upgrade the beta? Where do you get it? Is there a container that updates it or something? Unlike Sonarr, there is no update you can click and it is done. 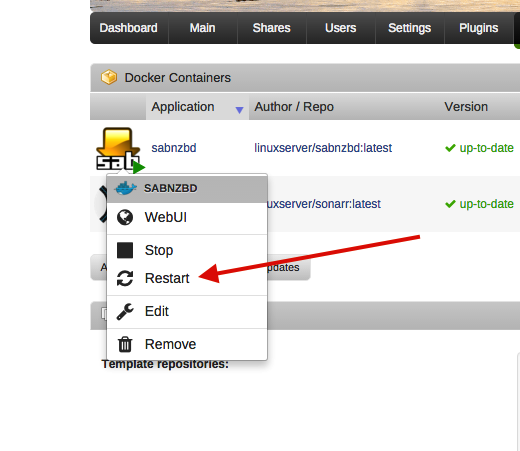 I don't use SABnzbd (NZBGet for me) But I know Sparklyballs does, I'll ask him to take a look for you..
sabnzbd has never been anything but beta, this is well known, and as with our other dockers , restart the docker to recieve update. If you mean just simply click on RESTART, done that. Still the same version. No sure if a setting is missing or something that I should have set. But it stayed at beta 1. I've just pulled SABnzbd to check and my completely fresh copy is on beta3 and I've never installed it before so I'm wondering if it's something local to you. Right now our link is fine. 3 to 8Mbps down. Over the weekend it seems that the tower was overloaded and I could not get more than .5 down. Dec 7 15:55:34 Server avahi-daemon: Withdrawing workstation service for veth7f41627. Dec 7 15:55:34 Server avahi-daemon: Withdrawing workstation service for veth81c51e5. Dec 7 15:55:34 Server avahi-daemon: Withdrawing workstation service for veth042b412. 2015-12-07 15:55:42,995::INFO::[sabnzbdplus:493] _yenc module... found! 2015-12-07 15:55:43,005::INFO::[_cplogging:216] [07/Dec/2015:15:55:43] ENGINE Started monitor thread '_TimeoutMonitor'. E: Method gave invalid 103 Redirect message <--- So it seems it can not do something. Here's what mine looks like after I restarted.. Yup...I get nothing like that as you can see. So then, now what? As it seems I am not getting the right data or something. I am running the current version of UnRAID also.